Take the worry out of reversing with the BC 20 wireless backup camera. It works alongside your Camper 760LMT-D or dēzl 760LMT¹ to seamlessly display footage right on your navigator. Easily spot vehicles, pedestrians and other obstructions right on your screen as you back up your Camper or rig. The transmitter will send camera footage to your navigator’s receiver mount up to 32 ft (10 m) away. Range varies based on installation. Some vehicles may require an extension cable (sold separately). 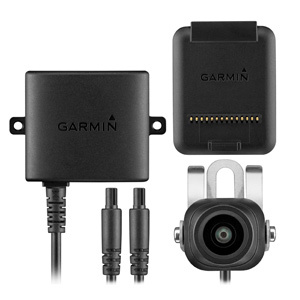 To install, take the BC 20 to your dealer (recommended) or mount the camera yourself on the rear of your vehicle and connect it to a power source, such as the rear lights. The BC 20 is rugged enough to withstand even the harshest of weather. ¹Requires software version 3.00 or later. Update may be required.